The Force Awakens” was the theme in 2015—on the big screen and in real life. Just as the characters in Star Wars were forced to face their old rivals, global conflicts increased around the globe and the market reacted. Economic stress in Greece and China, falling oil prices, and terrorist attacks in Paris and San Bernardino, CA, impacted equity markets worldwide. Of all the stock indexes, only the NASDAQ posted a gain for 2015. The S&P 500 index of large US companies ended with the first down year since 2008 while smaller and riskier US companies lost 5.7%. Developed international companies were down 3.3% despite a strong Q4, commodity-dependent Emerging Markets lost 17% for the year as oil prices reached an 11 year low, and bonds prices fell in the quarter as Treasury yields increased. When you look at your year-end statement, you may see that portfolio values trailed the Dow and the S&P 500. The reason? A diversified portfolio includes non-correlated assets—stocks that go up or down at different times—including energy and commodity stocks that fell due to low oil prices. Americans are smiling at the gas pump, but their portfolios are feeling the hit. Bonds investors were also disappointed as higher quality, short-term instruments that often provide defense against lower stock prices delivered less-than-expected yields. On another positive note, at the end of December, the Federal Open Market Committee raised interest rates .25% for the first time since 2006. The increase reflects the Fed’s view that the US economy is strengthening, and their decision was based on positive economic data: unemployment ended the year at 5.0%, GDP growth slowed to 2.0%, and inflation remained below the Fed’s 2.0% target. So what will 2016 hold? The only thing we can predict with any degree of certainty is that the US will have a new President. Bull market or bear market, no one knows. Investors should certainly expect continued volatility in equity prices, but as I’ve said time and again, the market is always headed in one direction: up. Our strategy is a disciplined approach to capital markets—staying diversified, keeping costs low, managing taxes, and rebalancing when needed—and we will continue to work with you to align your investment approach with your life goals, whatever they may be. There’s no doubt the world is changing at a record pace, and it may feel like your life and goals are changing just as fast. The Force has indeed awakened, but we’re always here to help…no matter what the universe throws our way in the future. 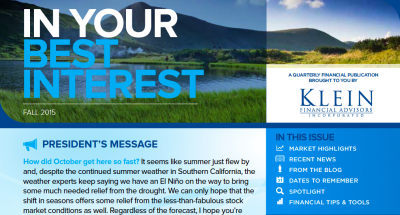 Click here to view the full newsletter, including recent news, important Q4 dates to remember, financial tips & tools, and more. The best thing about the third quarter of 2015 is that it is over. By the close of the quarter, most investors experienced a significant decline in their portfolios. August was especially dramatic, delivering a stock market decline of 11% in a span of just seven trading days. During the final week of the quarter, there were net stock mutual fund redemptions of almost $30 billion—the result of investors rushing to the exits in an attempt to thwart further losses. What happened to crush the optimism we’ve been feeling during the 6-year bull market that followed the Great Recession? Two stories dominated the headlines: the economic collapse in China and the Federal Reserve’s decision not to raise interest rates. China—the world’s second largest economy—saw its overheated stock market bubble burst and its currency devalued. The realization that China’s government isn’t a source for honest economic data cast doubt on China as the key driver of global economic growth. Although US economic indicators remain strong, the Fed opted not to raise interest rates because inflation hadn’t hit the 2% target established back in 2012. The decision to keep interest rates flat was interpreted by many as a sign of domestic economic troubles, adding to the near-panic that was already occurring on Wall Street. Year-to-date, losses remain relatively low. Bearish markets tend to follow bullish markets. Predicting short term prices is a fool’s errand. This recent decline is a market correction (defined as a drop of 10% or more). Price declines are like pruning back overgrowth and create a healthier market going forward. The US economy is strong. Consumer income, consumer spending, and housing starts are all up. Household net worth is at an all-time high, household debt has fallen by more than 30% since 2009, and home mortgage rates remain near alltime lows. Inflation has averaged only 2% for the past ten years, and the US dollar remains one of the of the world’s strongest currencies.